A while back I wrote about ways to stop accidental touchpad touches while typing, a problem that plagues many laptop and netbook users. Unfortunately, they were hit-or-miss solutions, not guaranteed to work on all systems. But reader Jim Power wrote in with an ingenious 10-second hack that should work on just about any laptop. All you need is a business card and a piece of clear tape. Place the card over the touchpad, then tape it on either side (so that the tape is affixed to the wrist rest, not to the touchpad itself). 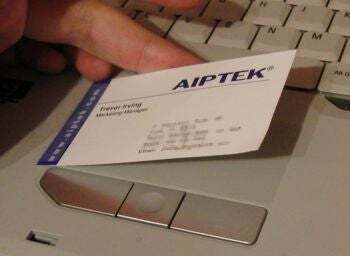 When you need to use the touchpad, just flip the business card over and out of the way. If you're typing and want to avoid accidental touchpad grazes, flip the card back so it covers the 'pad. As an added bonus, you've got identification stuck to your system in case it goes missing. Ingenious! Thanks for the idea, Jim. Here's hoping you've inspired other readers to submit their own hacks, fixes, and hassle solutions. Send 'em my way at hasslefree@pcworld.com.